DEADASWE – Page 2 – It's not what you wear, it's how you wear it. The Dark Side began a few days ago and The Little Bat has two exclusives out plus a gift for only $10L. Dark Side Nails is a hud for both finger and toe nails for SLink. There are 8 colours included on the hud. I like the design of these nails. The Lusty Outfit is the other exclusive. The outfit consists of a corset, pantyhose and wings. The hud has 16 colour changes (the ribbons), 8 for the corset and 8 for the pantyhose. Lastly the $10 gift is the Skele Tank, a layered tank, and the hud has 6 colour changes for the top and bottom tanks so you can mix them if you want. I’m wearing the Stella mesh head from LeLutka and Heidi looks gorgeous. In the photo below, from left to right, is the pale tone, the natural tone and the sunkissed tone. My pretty necklace is also found at We Love Roleplay from Lassitude & Ennui. The Pentacle Pendant comes in 3 metals and on touch the center stone changes colour. Each metal is only 120L during the event, then 160L when it moves to the main store. The Dreams Gacha opens tomorrow, April 6th and runs til April 28th. Petite Mort has 2 gacha machines entered; one filled with cool leather studded ballet flats and the other with the Satin Garden collection (tops, skirts and dresses). The Satin Garden Collection consists of 14 commons and 3 rares. The commons are pretty satin bustiers and satin-trimmed tulle skirts and the rares are pretty satin scrunchy dresses. The machine is only 50L per play. The Leather Studded Ballet Flats have 11 commons and 3 rares and are for the Belleza and SLink mesh feet. Each colour comes with silver and gold hardware. The commons are solid colours and rares are the leopard, floral and solid black flats. This machine is also 50L per play. When Katat0nik Pidgeon released her wonderful Intruder Masks last year, she had requests to release the Intruder Masks without the accessories (i.e., horns, santa hats, etc.). 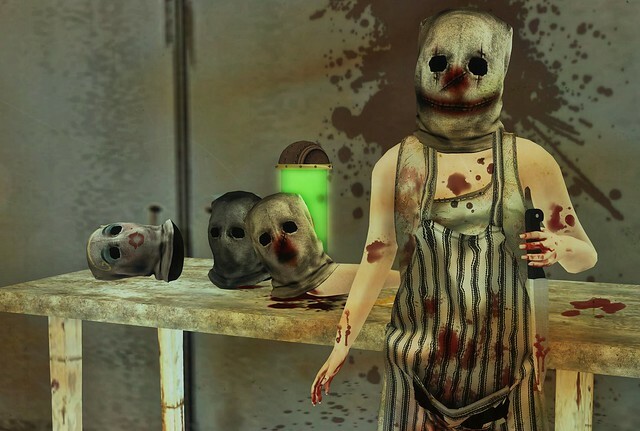 So of course Kat got on that and you`ll find these new Intruder Masks in her main store, up front with all the new releases. These are in a gacha with 1 rare and 9 common masks for 50L per play. The rare is a set of 2 masks (the happy/sad clown). In the photo I’m wearing the happy clown and on the table are the pretty, dark and bloody nose masks. The Little Bat released very pretty Glimmer Eyes for the current round of Suicide Dollz. The mesh eyes include a hud that allows you to change the left and right eye separately, giving you the choice to wear the same colour to 2 different colours at once. There are 12 colours for each eye and also 12 layers for default avatar. The annual Magic of Oz Easter Hunt is on! The Magic of Oz Easter Hunt began on March 23rd and runs until April 8th. When you arrive, touch the sign for your basket and run around clicking on easter eggs to fill your basket. Once filled, a menu will pop up with a choice of stores for you to choose one and you will receive eggs for that store’s gift. Go to that store on the Oz sim, wear the eggs near the basket in the store and touch the worn eggs for your gift. It’s great fun! Katat0nik has 2 gifts for the hunt. The adorably cute Eva Bunny V2 Tattoo Sleeves are original art tattoos. This is a new version from a previous release. They’ve been remade with new bunnies and brighter colours that includes 3 versions (dark, medium, light). The applier for the tattoos are for SLink male & female, Maitreya and Omega. There are tattoo layers as well but aren’t ideal as the default avatar makes the tattoos look pixelated so best bet is to use with the mesh bodies. I LOVE these tattoo sleeves. Katat0nik designed some fabulous socks for this round of Shiny Shabby. There are 2 gachas, one filled with flat feet socks and one filled with medium feet socks. Each machine holds 14 common and 2 rare pairs of socks at $60L per play. Each pair includes 2 sizes – regular and curvy. The curvy size is ideal for curvy shapes, men and mesh bodies like SLink’s Hourglass. The socks are not rigged so they can be resized and repositioned. They do not work with mesh feet or rigged mesh shoes. You may be able to wear some unrigged shoes with them with some adjusting and positioning.